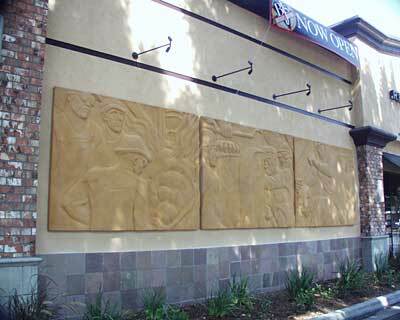 “Steel Workers” is a stone-like, three panel bas relief measuring 7 feet high and 29 feet wide. Adapted from an original Works Progress Administration (WPA) mural, this unique piece of sculptural artwork portrays heroic workers from the 1930s, representing core values of respect for the common man and the hard-earned dollars he chooses to spend. The original mural is thought to have been created by Howard Cook for installation in a Pennsylvania post office. 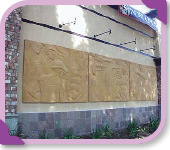 The art was adapted as a sculptural relief by architectural sculptor Jacquelyn Giuffre, who first interpreted the three panels as clay maquettes. Working in alliance with the Northern California art fabricator Kreysler & Associates, the pieces were scanned, digitally enlarged and re-sculpted using a “Computer Numerically Controlled” (CNC) milling process to create the final cast. These casts rendered the final three panels, closely resembling cast or carved stone. Giuffre has created several sculptures and designs for buildings including the Ronald Regan Court of Appeals Building, St. Joseph's Cathedral in San Jose and the San Francisco Ferry Building. Kreysler & Associates has been commissioned for digital enlarging and fabrication projects for companies including Walt Disney Imagineering, Universal Studios, Cingular Wireless and Boeing.